Each year there is a trifecta of series books that I look forward to with the utmost anticipation. They are the new Sookie Stackhouse (Charlaine Harris) novel, the new Harry Dresden (Jim Butcher) and the newest Hollows (Kim Harrison) book. 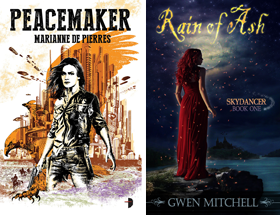 To me these are the heavy hitters or the MVPs of the Urban Fantasy genre (of course there are still plenty of other major leaguers). In preparation for each new release, I often reread the last few books or even the entire series in advance of the new book. 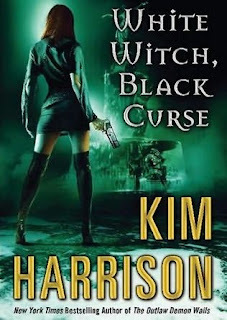 This time instead of re-reading the Hollows books while waiting for White Witch, Black Curse to arrive (Book 7 – Feb 24), I decided to listen to them, which I have been doing for the last several months. I had already thought Kim Harrison’s first person dialogue on the printed page was sumptuous, but listening to the dialogue performed raises the emotional overtones of the The Hollows books to a whole new level. Rachel, Ivy, Jenks, Trent, Kisten, Big Al and so many others literally come alive, a cliché I know, but for me it was true. Waiting for the Hollows books to come to the big or little screen? Well until they do these audiobook gems are the next best thing. My personal favourite is the fourth book, A Fistful of Charms. Listening to the books was akin to discovering them for the first time. If you are a Kim Harrison fan and have never experienced one of her books on audio I encourage you to do so. I have created some links below with samples from each of the books. Have a listen while we all tap our fingers waiting for White Witch, Black Curse. The Outlaw Demon Wails was not narrated by Marguerite Gavin and was somewhat of a let down by comparison, but still enlivens the story in a refreshing manner. Doug, I am as well waiting for the Turn Coat, Dead and Gone, and Dayhunter as well as WWBC (being the first to be released). Marguerite Gavin is being brought back to do the audio for WWBC, so all will be well again. Thanks for you great blog, I enjoy it almost daily. That's a great idea! I'm heading over to my library's site to see if they have them in audio. (I own then in paper.) :) Though there are areas where I cry and I hate to cry while driving. After that book (in which I cried) I never know what to expect from her. Kim Harrison certainly is an author that grabs your attention and doesn't let go until the last word is read. Thanks Dottie, it's good to hear Marguerite will be back. Only six weeks to go until the first biggie of the year. Hi Jessica, yeah I have the books too but am really glad I tried the audio versions. Have to admit to being misty-eyed on more then one occasion while listening. I am currently listening to these audio books in my car and enjoying every minute of them. I agree that they are great! Marguerite really does bring these books to life.